UPDATE: Obama's was bigger than Trump's, GDP growth that is! "President Trump received his first official estimate Thursday of how his proposals would affect the economy. The results were mediocre — especially compared with the numbers for President Barack Obama while he was in office. Trump's proposals so far would only add about 0.1 percentage points to growth in gross domestic product, according to the nonpartisan Congressional Budget Office (CBO). That would increase the pace of GDP growth to just 1.9 percent a year, much slower than the 3 percent administration officials have promised. After a decade, GDP would only be about 0.7 percent greater if Trump's proposals were enacted, the CBO predicted. 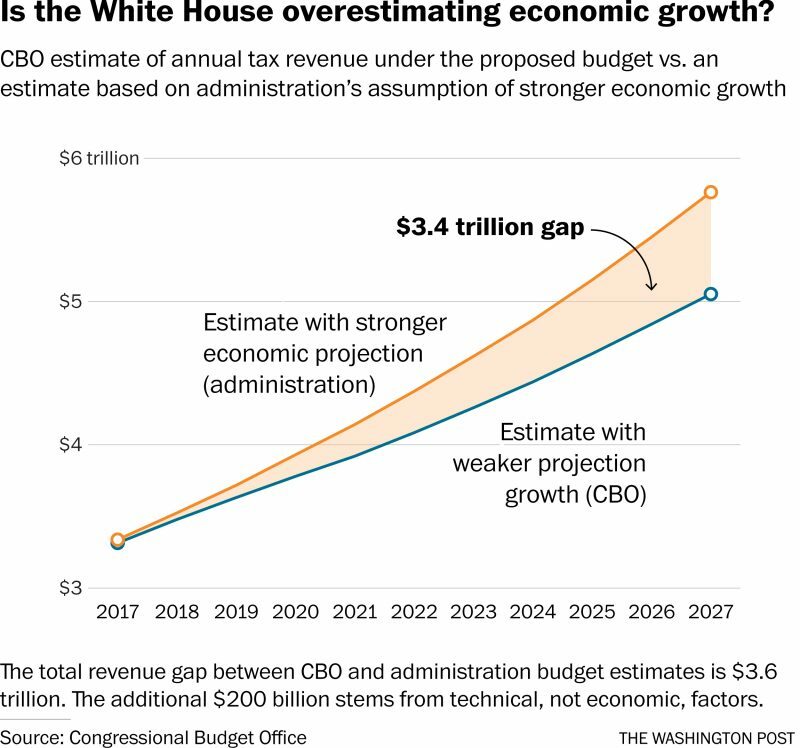 Obama's plans would have expanded GDP by substantially more. For instance, the budget he put forward in 2014 would have increased overall economic activity by 2.1 percent after a decade, the CBO said at the time." Read the Washington Post, Let’s take a look at how the CBO thinks Trump’s proposals stack up against Obama’s. It's easy to make false promises using rosy scenarios. "The Congressional Budget Office said Thursday that President Trump’s first budget plan would not eliminate the deficit over 10 years or expand the economy at all by 2021, casting doubt on the administration's controversial economic assumptions that were supposed to bolster key arguments for the White House’s agenda over the next year. The CBO projected that the sweeping spending reductions on anti-poverty programs, housing, environmental protection and a number of other initiatives that the White House wants to cull back would still not be enough to eliminate the deficit by 2027. 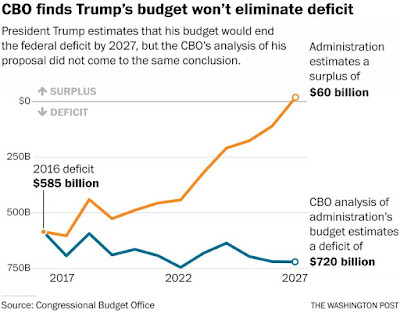 In that year, the deficit would be $720 billion under the White House's budget, the CBO said. The White House asserted the government would have a budget surplus in 2027 if its policies were enacted, bringing in more money through revenue than it spent. That's a gap of more than $700 billion in just one year between the CBO and White House. 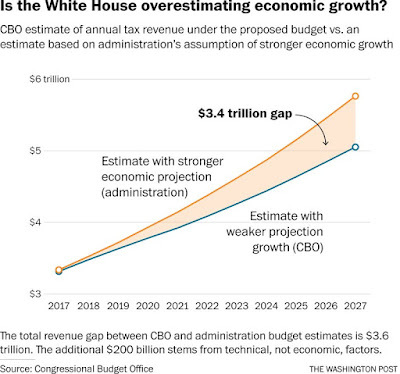 This contrasts sharply with the White House’s internal estimates, which argued that cutting taxes would create an economic boom that solved many of the country’s budget problems. The White House also estimated that its budget changes would lead the economy to grow by 3 percent per year. The CBO found, however, that economic growth would average only 1.9 percent per year under the White House's plan." Read the Washington Post, White House budget wouldn’t eliminate deficit or do much to expand economy, CBO says. Trump's Big CON: Incompetence and Mismanagement Aggravated by Nepotism and Dishonesty, Trump, You're Fired! UPDATE III: So how did this happen? "Trump’s embrace of a kind of nepotism that’s historically been more common in banana republics than the first world continues to backfire on him — creating a myriad of legal and political headaches. And they’re probably only going to get worse." Read the Washington Post, Trump’s children become bigger liabilities for the White House, complicate damage-control efforts. UPDATE II: So The Donald Jr., "received an email from an acquaintance asking explicitly whether he’d be interested in the Russian government’s help in the campaign, and instead of responding, 'Please don’t contact me again' and informing the FBI, he said, 'If it’s what you say I love it' and forwarded the email on to his father’s closest adviser (also his brother-in-law, Jared Kushner) and the campaign’s chairman, who apparently both had the same response. . .
[In addition,] Kushner forgot to list the meeting when he filled out those forms, just as he forgot to list other meetings he had with influential Russian figures — oops! I suppose he thought no one would notice. But they did, and the result is this explosion. Not that it should be shocking to learn that Kushner screwed up. By many accounts, he’s a walking caricature of the entitled white guy who thinks the silver spoon he was born with was actually bestowed upon him as a reward for his uncommon brilliance (read here about how his father likely bought Jared’s admission to Harvard University with a well-timed $2.5 million donation). Like the Trump boys, Kushner never had to make it on his own — he was given every privilege a rich kid’s son can have, then went to work in the family business. Yet his father-in-law believes Kushner is such an extraordinary talent that he can reinvent government, reform the criminal justice system, solve the opioid epidemic and achieve peace in the Middle East." Read the Washington Post, The Trump White House is a confederacy of dingbats. UPDATE: "The Trumps are congenitally unable to take personal responsibility. 'In retrospect, I probably would have done things a little differently,' Donald Trump Jr. told Sean Hannity on Fox News last night. But don’t mistake that for a mea culpa. Because it wasn’t. The president’s namesake dismissed his sitdown last summer with someone he believed to be an agent of the Russian government as 'a nothing.' . .
Trump Jr. posted on Twitter earlier in the day what he claimed was the entirety of the exchange in which he agreed to take a meeting with a 'Russian government attorney' who could provide damaging information about Hillary Clinton as part of 'Russia and its government’s support' for his dad’s presidential campaign. [Ironically,] Donald Sr.’s rationale for seeking the presidency was his competence as a manager. Many voters assumed that because he is rich and once hosted a successful reality-television show, Trump could effectively lead an organization. The more details that emerge about how his campaign really operated behind the scenes — and how paralyzed his White House is now — the clearer it becomes that the president is in way over his head. Even more than in normal organizations, the person at the top of any campaign or White House sets the tone that everyone else follows. When the leader plays fast and loose with the rules and the truth, it creates a problematic culture. Sen. John McCain (R-Ariz.), who believes Trump Jr. needs to testify before Congress as soon as possible, said yesterday that no one on his 2008 presidential campaign would have ever agreed to take such a meeting. 'Another shoe drops from the centipede every few days,' the Arizona senator told The Weekly Standard. 'I can assure you the people around me would not be inclined to do that kind of thing, especially not one of my sons. 'Cause my sons — they're in the military. You know, they'd probably be court-martialed.' . .
[Trump and his family are] blaming others for problems they themselves are responsible for creating. It’s the continuation of a pattern that goes back decades." Read the Washington Post, Trump dysfunction follows family from the campaign to the White House. "'Rookie mistake': the all-purpose defense of the Trump White House. . . Returning from three weeks abroad, I’ve been catching up on developments at home. These weeks, though highly abnormal by usual standards, were fairly typical of the Trump presidency. Mistakes and outrages are so common that we become numb to them. But stack three weeks of the embarrassments together and the cumulative effect makes it plain that this is amateur hour for the greatest nation on Earth". Read the Washington Post, This is no ‘rookie mistake.’ The Trump team shouldn’t even be on the field. The article includes a list of some of Trump's 'Rookie mistakes'. These people are TOO STUPID to be running the country.